I gave myself permission to take a break from blogging in July of this year – I had crazy work and study commitments and I was working in a country area, 4 hours away from my home. So it was okay, in my mind, to not blog until mid – late August. The break was not meant to include the months of September, October and November. That was a bona-fide blogging slump, accompanied by a reading slump. I made no blog posts and read a book a month, instead of a book a week. I forgot I was a book blogger – and I knew it was bad when I deleted the WordPress app from my phone. I was still using twitter, and luckily I started reading again, which lead me back to the blog. Here are 5 ways that can help you break a blogging slump, if you find your blogging a little lackluster. Read blogs – give yourself half an hour to scroll through your ‘reader’ feed, or check in at bloglovin’, if you have one. If you spend 30 minutes reading what is happening in other people’s lives, and checkout their book enthusiasm; you will probably see something that inspires you, or something that gives you some ideas of what to do next. Join a challenge or set a goal – I joined the #12forXmas challenge, in which I attempt to read 12 books in December. Joining a challenge, especially a reading challenge, is a great way to break a slump because it gives you two types of content – posts about the challenge itself (eg. sign ups, progress posts) and books to review on your blog! Read a book you won’t resist blogging about – Be it a new release from your favourite author, a book that the book blogging community is currently raving about or a classic that you think you will hate. Choose a book to read and review that you know you will have opinions about – and then blog about it! Commit to blogging for 15 minutes – I’m a big fan in telling myself that I can do anything for 15 minutes, so make it your goal to write a draft of a blog post in 15 minutes. Tell yourself that after 15 minutes you have permission to walk away. I find that once I start typing and thinking, I’m happy to continue until I have something publishable. Talk to someone in real life about your blog – Take a few minutes to bring up your blogging with a friend or family member, or even a complete stranger. The best way of ensuring new content is to then give the URL of your blog to that person, it will inspire you to put something new on the blog so that your friend (family, stranger) doesn’t look up your blog and think you are a weirdo for talking up a blog you haven’t updated for months. Whatever you do – once you have your mojo back, take advantage and get back into the swing of things again, get writing, get interacting and enjoy the process! Blogging is fun, but just like reading, you can go through productive and quiet times, it’s just important to have a few ideas on how to get back into the swing of things again. Do you have any sure-fire ways of breaking a slump? Do you find that you have blogging/reading slumps at certain times of the year? Is it a cycle? Do you just burn out? Run out of ideas? Bloggiesta – My First Time! I’ve seen a couple of posts in the last week of people signing up for Bloggiesta, so I checked it out and realised that it was exactly what I need. Although, it will be an Autumn Bloggiesta for me. A week to focus on all those blogging things that get shoved away. I’m starting to schedule posts for April, hoping that from there I can stick to a structured blog schedule (hahaha we will see how that goes) and Bloggiesta seems like a great way of building towards that. I’ve never participated in one of these before, so I’m excited to GET. STUFF. DONE. I’ve broken my To Do into two focus areas – writing posts & reviews and social media & networking… because I really do need to work on both those things. Write at least three new posts, and pay attention to quality! 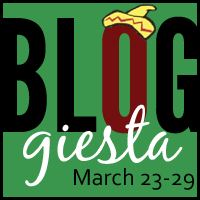 Comment on other Bloggiesta blogs, and meet some peoples! Participate in at least 2 challenges! So, quite a lengthy list, but it’s mostly (besides the writing posts) fun or easy-ish stuff, and I won’t be beating myself up if I don’t get there. I’m going to set aside 90 minutes every day during bloggiesta for these tasks, and see how much I can get done without distraction.